Folsom, Calif. - The Folsom Police Department is asking for the public's help in locating a suspect wanted as part of a fraud investigation. 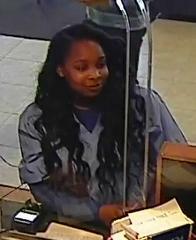 Detectives believe the woman shown in the surveillance images above is involved in impersonating a bank customer and withdrawing money. No Comment to " Folsom Police Seek Assistance in Identifying Suspect in Fraud Investigation "